Traffic along Epifanio Delos Santos Avenue (EDSA) or Circumferential Road 4 is quite infamous considering it being a if not the main artery of Metro Manila and carrying much vehicular and passenger traffic between cities like Pasay City, Makati City, Mandaluyong City, Pasig City, Quezon City and Caloocan City where it has major junctions with other major thoroughfares like Roxas Boulevard, South Superhighway, Ayala Ave., Gil Puyat (Buendia) Ave., Shaw Blvd., Ortigas Ave., Aurora Blvd., East and Timog Avenues, Quezon Ave., North Ave., Roosevelt Ave., NLEX and A. Bonifacio Ave., Rizal Ave. and MacArthur Highway. Shown in the following photos are traffic conditions along EDSA during a holiday, and typical afternoon peak and evening on a weekday. The section featured is the stretch from the Ortigas junction to Camp Aguinaldo. Visible in the photos are the high-rise condominiums along Connecticut Street (upper left) and the developments at the Araneta Center including the Araneta Coliseum in the Cubao commercial district. The green area on the upper right is Camp Aguinaldo, headquarters of the Armed Forces of the Philippines (AFP), while the rooftops at the right are of houses located in an high-end exclusive subdivision (Corinthian Gardens). In the middle of EDSA is the MRT-3’s elevated tracks. 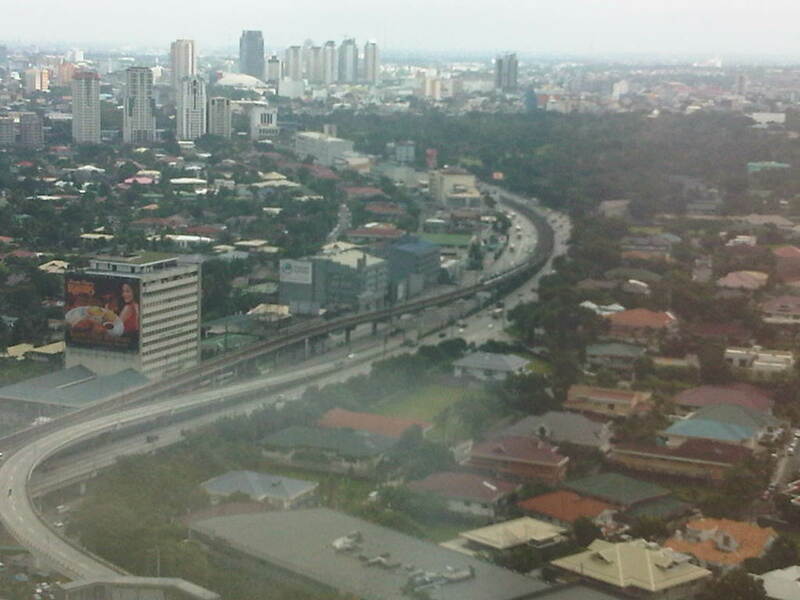 Photo taken from the 35F of the Robinsons-Equitable Tower shows light traffic along EDSA during a holiday. Traffic probably is similar during Sundays while such volumes may be observed on Saturdays only in the early mornings; before 9:00 or 10:00 AM when the shopping malls open. 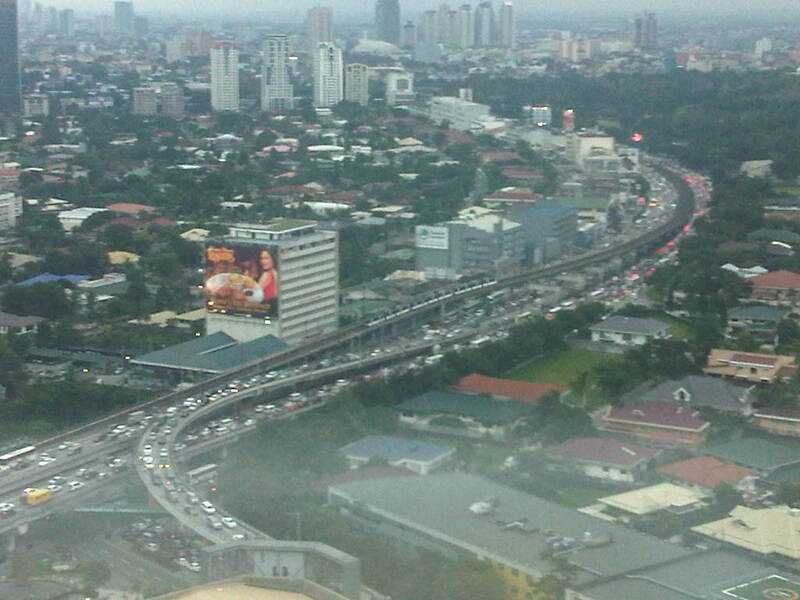 Photo taken at 5:44 pm showing traffic congestion on both directions (northbound and southbound) of EDSA including the overpasses at its intersection with Ortigas Ave. An MRT-3 train is visible in the middle of the photo. Photo taken at 6:16 pm with the headlights and taillights indicative of the traffic density during the early evening. 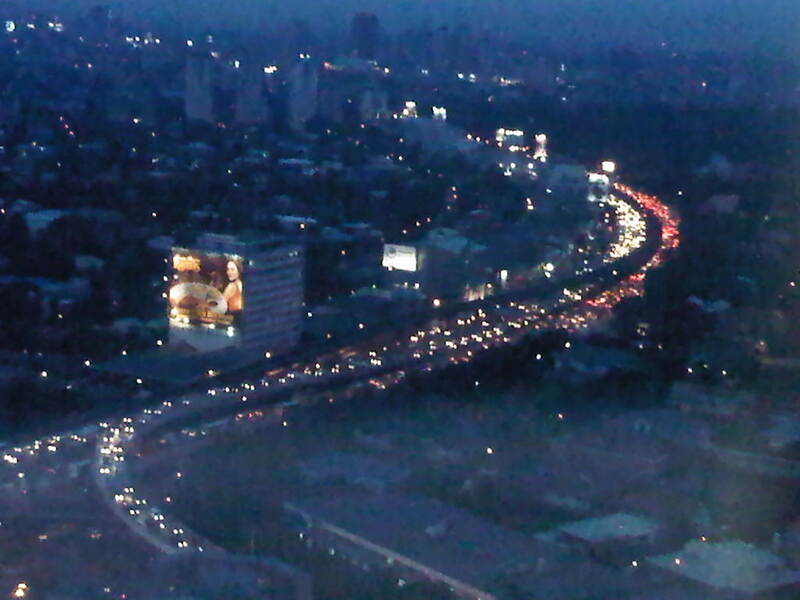 Such congestion now usually extends past 8:00 pm with cases where EDSA is still congested near midnight. Such cases are more common now rather than exceptional. By d0ctrine in Highways and Streets, Traffic Congestion, Traffic flow, Traffic Management on September 1, 2012 .